Mark has proven that if you have the ambition, desire and tenacity that anything is possible. 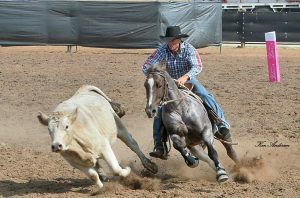 He has continuously strived to develop his horsemanship and training skills which now culminates to be one of the most intense, correct and exciting campdraft displays on the circuit. Like most who have dedicated a lifetime to their profession Mark has an innate understanding of everything related to performance horse training and an effective way of communicating his techniques. For more info on Mark check out his profile on Select Sires here. These videos are a must watch for those who want to understand more about his refined, yet relatively straight forward training methods.